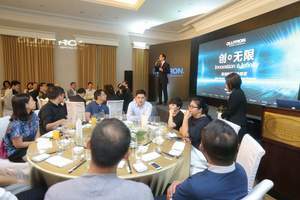 SOURCE: Lutron Electronics Co., Inc.
HONG KONG, CHINA--(Marketwired - Jun 18, 2015) - Over 300 members of the building and construction industry gathered at the "Innovation & Infinity" events taken place at Peninsula Hotel in Hong Kong and No. 1 Waitanyuan in Shanghai in early June to get an exclusive look at the latest light control solutions offered by Lutron Electronics Co., Inc.. A cocktail and gala dinner unveiled the event in both cities, offering all guests a preview of Lutron innovations, followed by a seminar on the next day to introduce Lutron's hospitality and commercial solutions in details. This first stop of this Asia roadshow was Singapore where Lutron partnered with Singapore Green Building Council to organize a 2-day event at Four Seasons Hotel during 27-28 May. Then the whole team from Lutron US Headquarters travelled to Hong Kong as the 2nd stop and ended the Asia roadshow in Shanghai on 12 June. "As the name of the event suggests, Lutron thrives on innovations and our various inventions in light control industry can offer infinite possibilities for designers to realize their designs while meeting the objectives of energy saving, convenience, ambience, comfort and operational efficiency. Lutron's products deliver world-class performance and meet stringent return-on-investment requirement", says Mr Derek Yung, Sales Director of Lutron for Greater China. myRoom™ hotel guestroom management system that integrates with property and building management systems to enrich the hotel guest experience as well as lower energy use and operating costs. Palladiom™ keypads with large, backlit and tactile buttons that offer intuitive control of lights and shades per customized engraving. Palladiom thermostat with large backlit LCD display and built in occupancy sensor. Quantum Vue™ -- a powerful software that allows facility mangers to manage their electric light and daylight for maximum energy efficiency, comfort, and productivity. About this company Lutron Electronics Co., Inc.